Introduction: Regenerative endodontics provides hope of converting the non-vital tooth into vital once again. It focuses on substituting traumatized and pathological pulp with functional pulp tissue. Current regenerative procedures successfully produce root development but still fail to re-establish real pulp tissue and give unpredictable results. There are several drawbacks that need to be addressed to improve the quality and efficiency of the treatment. Aim: The aim of this review article is to discuss major priorities that ought to be dealt before applications of regenerative endodontics flourish the clinical practice. Materials and Methods: A web-based research on MEDLINE was done using filter terms Review, published in the last 10 years and Dental journals. Keywords used for research were "regenerative endodontics," "dental stem cells," "growth factor regeneration," "scaffolds," and "challenges in regeneration." This review article screened about 150 articles and then the relevant information was compiled. Results: Inspite of the impressive growth in regenerative endodontic field, there are certain loopholes in the existing treatment protocols that might sometimes result in undesired and unpredictable outcomes. Conclusion: Considerable research and development efforts are required to improve and update existing regenerative endodontic strategies to make it an effective, safe, and biological mode to save teeth. There is an immense difference between tradizional Endodontic Surgery and Micro-Endo Surgery. Microsurgical techniques made possible and accessible results,that were unimaginable before.Under microscopic control,the operative techniques reached continous changes,allowing a better precision and quality standards. The dramatic evolution from Endo Surgery to Micro-Endo Surgery has enlarged the horizon of therapeutic options. Illumination and magnification through the Microscope has fundamentally and radically changed the way endo surgery can be performed. Aim: The purpose of this study was to evaluate the effects of three electronic apex locators (EAL), electric pulp tester (EPT) and diathermy on pacemaker function in vitro. Materials and Methods: Three EALs: Root ZX (J. Morita Co., Tustin, CA, U.S.A.), Propex (Dentsply), Mini Apex locator (SybronEndo, Anaheim, CA, USA), EPT (Parkell pulp vitality tester Farmingdale, NY, USA) and Diathermy (Neomed 250 B) were tested for any interference with one pacemaker (A medtronic kappa KVDD901-serial number: PLE734632S). 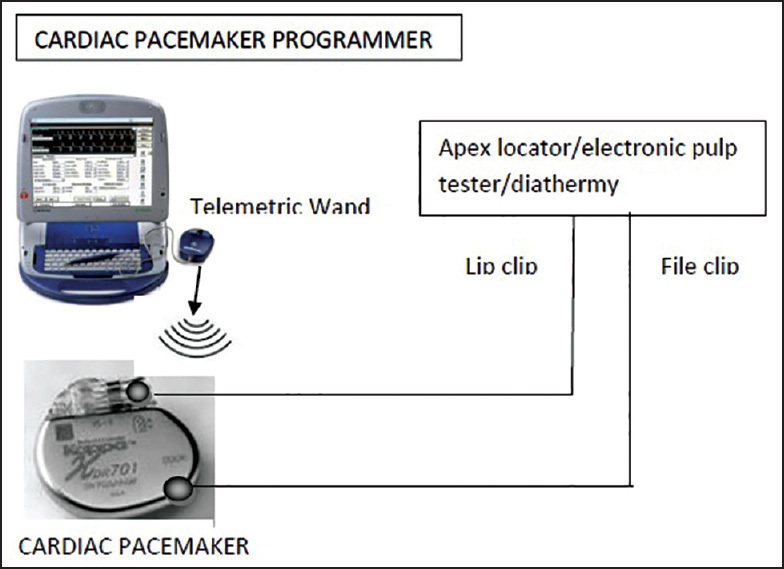 Directly connecting the pacemaker lead with the EAL/EPT/diathermy operating on a flat bench top, the telemetry wand was held directly over the pacemaker to monitor the pacing pattern for a period of 30 s. Pacemaker activity was continuously recorded on the telemetric programmer and electro gram (EGM) readings examined for pacer inhibition, noise reversion or inappropriate pacemaker pulses. Results: All the three apex locators showed no pacing interference or background noise during its function or at rest. The EGM readings of EPT showed varying levels of background noise in between pacing however, this did not affect the normal pacing pattern and the pacing interval remained constant. EGM readings of diathermy showed an increase in the pacing interval (irregular pacing pattern) followed by complete inhibition of the pacing system. Conclusion: The tested EALs do not interfere with cardiac pacemaker function. The tested EPT showed varying levels of background noise but does not interfere with cardiac pacemaker function. Use of Diathermy interfered with the normal pacing, leading to complete inhibition of the pacing system. Context: There are limited studies on comparison of Total etch (TE) and Self etch (SE) adhesive for placement of sealants. Aims: The aim of the study was to compare the retention of fissure sealants placed using TE adhesive to those sealants placed using SE (seventh generation) adhesive. Settings and Design: The study was conducted in the dental section, Aga Khan University Hospital. This study was a randomized single blinded trial with a split mouth design. Materials and Methods: The study included 37 patients, 101 teeth were included in both study groups. The intervention arm was treated with SE Adhesive (Adper Easy One, 3M ESPE, US). Control arm received TE adhesive (Adper Single Bond 2, 3M ESPE, US) before sealant application. The patients were followed after 6 months for assessment of sealant retention. Statistical analysis used: Interexaminer agreement for outcome assessment was assessed by Kappa Statistics and outcome in intervention group was assessed by McNemar's test. 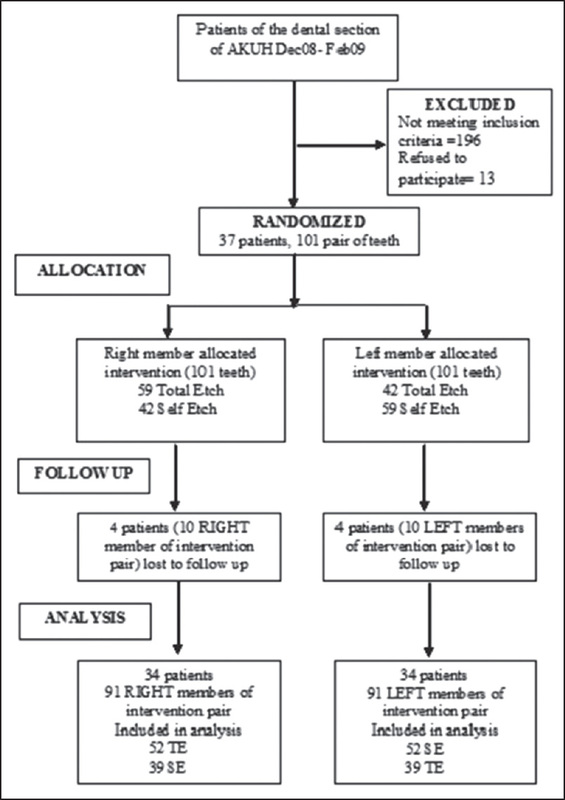 Results: Ninety-one pairs of molar (90%) were reevaluated for sealant retention. Complete retention was 56% in TE arm and 28% in SE arm with an odds ratio (OR) of 3.7. Conclusions: Sealants applied with TE adhesives show higher rate of complete sealant retention than SE adhesive. Objectives: To evaluate the effect of amalgam corrosion products in non-discolored dentin on the bond strength of replaced composite resin. Materials and Methods: One hundred and sixty-one Class I cavities were prepared on extracted premolars and divided into seven groups. Group 1: Light-cured composite; Groups 2, 3, and 4: Amalgam stored in 37°C normal saline for respectively 1, 3, and 6 months and then replaced with composite leaving the cavity walls intact. Groups 5, 6, and 7: Identical to Groups 2, 3, and 4, except the cavity walls were extended 0.5 mm after amalgam removal. Eighteen specimens from each group were selected for shear bond strength testing, while on remaining five samples, elemental microanalysis was conducted. Data were analyzed using Mann-Whitney and Freidman (α = 0.05). Results: There was a significant difference between Groups 1 and 4 and also between Group 1 and Groups 5, 6, and 7. However, Groups 1, 2, and 3 showed no significant difference regarding bond strength. Bond strengths of Group 4 was significantly less than Groups 2 and 3. However, Groups 5, 6, and 7 showed similar bond strength. There was no difference among all groups in terms of metal elements at any storage times. 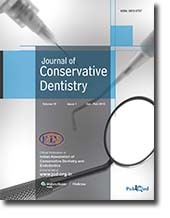 Aims: The aim of this cross-sectional study was to determine the prevalence of periradicular radiolucencies (PR) from an urban adult Indian population and to investigate the quality of root canal procedures and coronal restorations and their association with prevalence of PR in root-filled teeth. Settings and Design: Cross-sectional study. Material and Methods: A total of 1,340 subjects (18+ years of age) who reported for non-emergency dental care to 5 different dental care centers had their panoramic radiographs taken during the period from January to December 2013. 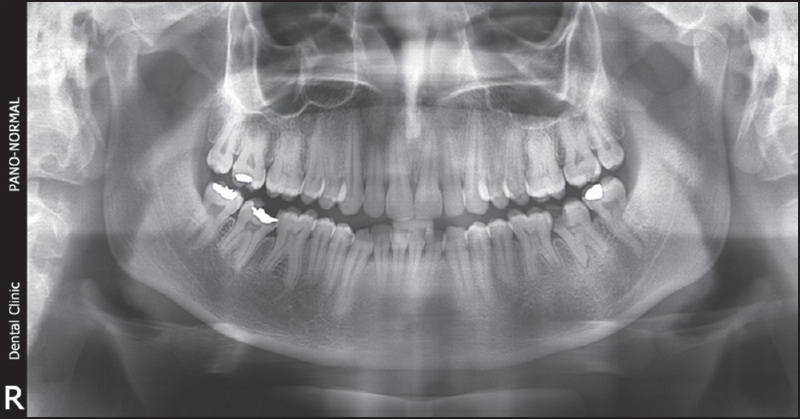 The periradicular status of 30,098 teeth in these radiographs was evaluated using the Periapical Index Score (PAI). The assessment of the technical quality of the procedure was evaluated based on the criteria of root canal filling length and quality of coronal restoration. Statistical Analysis Used: The data was analyzed statistically by chi-squared test and odds ratio. Results: PR was found in 65% of subjects (n = 865) and 5.8% (n = 1,759) of the 30,098 teeth evaluated (4.30% untreated teeth and 1.53% were root-filled teeth). In all, 4.1% of the teeth (n = 1,234) had some filling material in the root canal(s) and the prevalence of PR in these root-filled teeth was 37.4%, while the remaining 62.6% of root canal-filled teeth showed no evidence of PR. PR occurred significantly more often in teeth where root canal filling was filled more than 2 mm short of radiographic apex or when root filling extruded through the apex. Conclusions: The prevalence of PR in teeth with untreated root canals in India is 4.30%, which is more than twice the weighted world average, while the prevalence of root-filled teeth (4.1%) is lower than the world average (9.6%). The prevalence of PR in root-filled teeth in India is comparable to that in other populations. Inadequate root canal treatment and poor quality of coronal restoration were associated with increased prevalence of PR. Objectives: To evaluate the efficacy of ultrasound in differential diagnosis of periapical radiolucencies. Materials and Methods: Ten patients aged between 19 years and 40 years with periapical lesions associated with anterior maxillary or mandibular teeth were selected and consented for the study. Pre-operative periapical radiographs were obtained. Measurements and provisional diagnoses of the apical areas were made by two specialist observers on two separate occasions. Preoperative ultrasound examinations with Doppler flowmetry were then performed and the images assessed by two specialist observers for the size, contents, vascular supply and a provisional diagnosis made as to whether the lesion was a cyst or granuloma. Endodontic surgery was performed including curettage of the apical tissues to enable histopathological investigation, which provided the gold standard diagnosis. All measurements and findings were compared and statistically analyzed. Results: Total 10 lesions were identified in 10 patients. On periapical radiographs, lesions were readily identified but observers were unable to differentiate granuloma from cyst using either modality. Where sufficient buccal cortical bone had been resorbed, ultrasound imaging was simple but underestimated the size of the lesions compared with periapical radiographs. In all cases, the ultrasound diagnosis agreed with the histopathological gold standard. 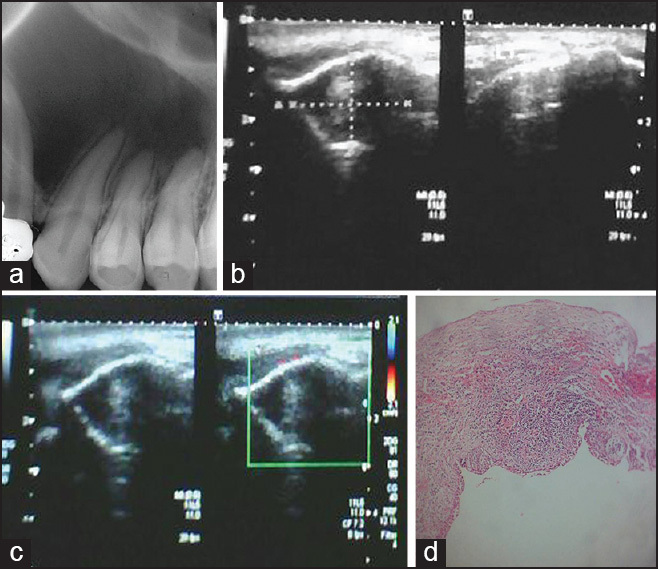 Conclusion: Ultrasonography (USG) can provide accurate information about the nature of intraosseous lesions of the jaws before any surgical procedure. It is proposed that USG with Doppler flowmetry can provide an additional diagnostic tool without invasive surgery, where treatment option is nonsurgical. Objective: To evaluate the antibacterial and antifungal properties of calcium-based cement, Biodentine (Ca 3 SiO 2 ), compared to commercial glass ionomer cements (GICs) and mineral trioxide aggregate (MTA). Materials and Methods: Pellets of GICs, ProRoot MTA, and Biodentine were prepared to test the influence of these cements on the growth of four oral microbial strains: Streptococcus mutans, Enterococcus faecalis, Escherichia coli, and Candida albicans; using agar diffusion method. Wells were formed by removing the agar and the manipulated materials were immediately placed in the wells. The pellets were lodged in seeded plates and the growth inhibition diameter around the material was measured after 24-72 h incubation at 37°C. The data were analyzed using analysis of variance (ANOVA) test to compare the differences among the three cements at different concentrations. Results: Test indicates that the antimicrobial activity of Biodentine, on all the microorganisms tested, was very strong, showing a mean inhibition zone of 3.2 mm, which extends over time towards all the strains. For Biodentine, GIC, and MTA, the diameters of the inhibition zones for S. mutans were significantly larger than for E. faecalis, Candida, and E. coli (P < 0.05). Conclusion: All materials showed antimicrobial activity against the tested strains except for GIC on Candida. Largest inhibition zone was observed for Streptococcus group. Biodentine created larger inhibition zones than MTA and GIC. Context: Delayed replantation of avulsed teeth may be successful if the majority of periodontal ligament cells (PDL) survive. A proper transport medium is required when immediate replantation is not possible. Green tea extract (GTE) may be effective in preserving the cells because of its special properties. Aims: This study was done to evaluate the potential of GTE in periodontal ligament cells preservation. Materials and Methods: Fifty-four extracted human teeth with closed apices were randomly divided into three groups each with 18 teeth as follow: GTE, water (negative control), and Hank's balanced salt solution (HBSS) (positive control). The specimens were immersed in the media for 1, 3, and 15 hours at 4 o C (n = 6) and treated with collagenase 1A for 45 minutes. Cell viability was determined using the trypan blue exclusion technique. Statistical Analysis: Data were analyzed by one-way analysis of variance (ANOVA), post hoc Tukey and paired t-test at significance level of P < 0.05. 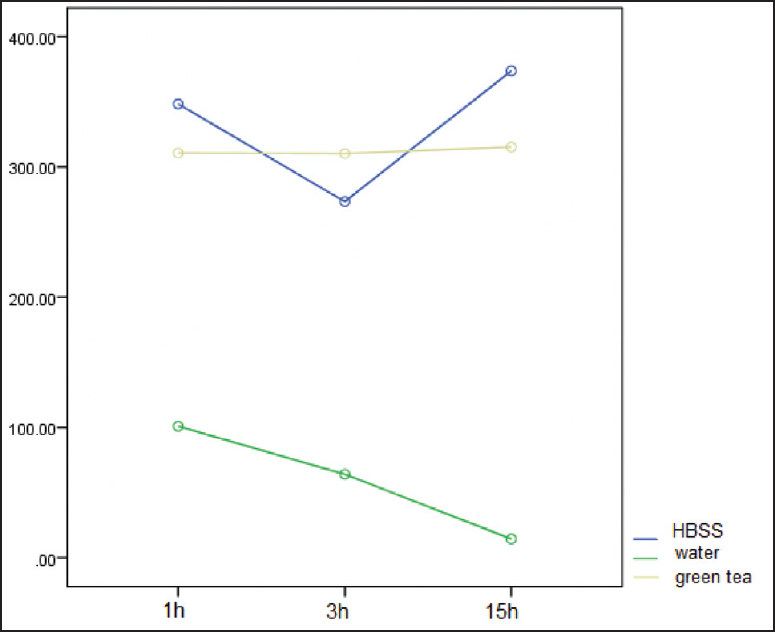 Results: Means (standard deviation, SD) of viable cells in HBSS, water, and GTE were estimated 348.33 ± 88.49, 101 ± 14.18, and 310.56 ± 56.97 at 1 hours; 273.4 ± 44.80, 64.16 ± 16.44, and 310.2 ± 11.21 at 3 hours; and 373.72 ± 67.81, 14.41 ± 2.88 and 315.24 ± 34.48 at 15 hours; respectively. No significant differences were found between HBSS and GTE at all the time intervals. Both these solutions could preserve the cells more than water significantly. Conclusion: GTE and HBSS were equally effective in preserving the cells and were significantly superior to water. Context: Epigallocatechin-3-gallate (EGCG) is a flavonoid extracted from green tea that demonstrated antimicrobial activity. 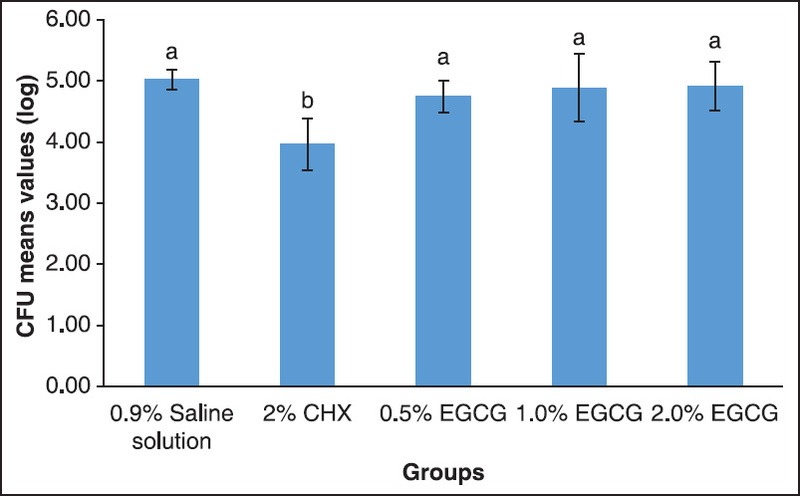 Aims: To evaluate the efficacy of EGCG 0.5%, 1%, and 2% concentrations as an antimicrobial solution in dentin caries-like lesions induced in a bacterial-based in vitro model. Materials and Methods: Twenty-five human dentin specimens were submitted to a microbial-based caries model by immersion in brain heart infusion (BHI) broth inoculated with Streptococcus mutans UA159, for 5 days. After the demineralization period, the specimens were randomly divided into groups: Group I: 0.9% saline solution; Group II: 2% chlorhexidine digluconate; Group III: 0.5% EGCG; Group IV: 1% EGCG; and Group V: 2% EGCG. After the treatments, carious dentin samples were harvested from dentin specimens and analyzed by colony-forming unit (CFU) counts. Data were analyzed by ANOVA and Tukey's test. Results: Log reduction values (SD, CFU.mg -1 ) for Groups I-V were: 5.02 (0.16), 3.96 (0.43), 4.74 (0.26), 4.89 (0.56), and 4.91 (0.40), respectively. There was no statistical difference between the EGCG concentrations and saline solution (P > 0.05). Furthermore, there was no statistical difference between EGCG concentrations (P > 0.05). However, there was a statistically significant difference between the chlorhexidine digluconate group and the other groups (P < 0.05). Conclusion: EGCG at the studied concentrations were not effective in eliminating S. mutans from dentin caries-like lesions. Objective: To evaluate the cervical marginal and internal adaptation of posterior bulk fill resin composites of different viscosities, before and after thermo-cycling (TMC). 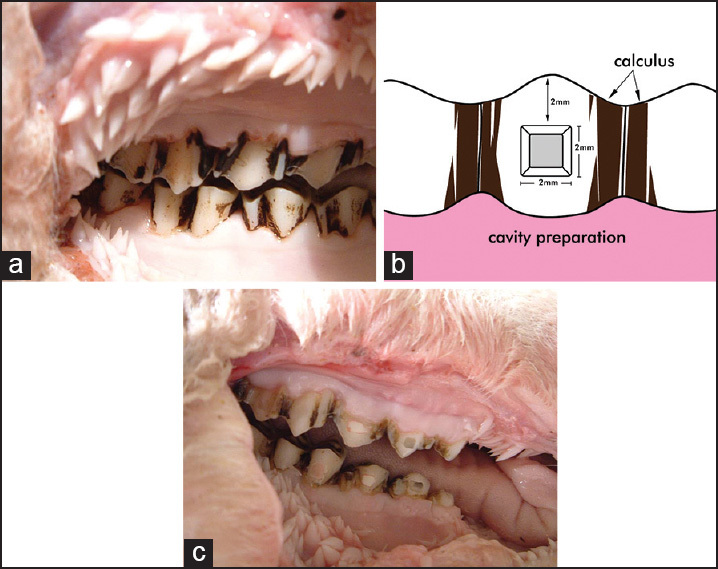 Materials and Methods: Eighty box-only class II cavities were prepared in 40 extracted human premolars with the distal proximal box beneath the enamel-cementum junction (CEJ). The teeth in the experimental groups were restored with bulk fill resin composite restorations (Gr. I- Sonic Fill, Gr. II- SDR, Gr. III- Tetric N Ceram Bulk Fill or a conventional composite designed for 2-mm increments (Gr. IV- Tetric N Flow along with Tetric N Ceram). Before and after thermal cycling, the gap-free marginal length was analyzed using SEM of epoxy resin replicas. After thermal cycling, specimens were cut longitudinally in order to investigate internal dentine adaptation by epoxy replicas under SEM (500 × magnification). Results: Statistical analysis was performed using the ANOVA and Tukey Post Hoc tests (P < 0.05). In enamel, high percentages of gap-free margins were initially identified for all the groups, which declined after thermal cycling. However, no significant differences were identified among any of the groups (P > 0.05). In dentine, bulk fill groups performed at par with the incremental placement; for both marginal and internal adaptation (P < 0.05), for all materials except Tetric N Ceram Bulk Fill. Conclusions: Viscosity of the bulk fill restorative material influenced the proportion of gap-free marginal interface and the internal adaptation in dentin. Aim: Comparative assessment of apical sealing ability of a novel Smart-Seal System, Resilon, and conventional Gutta-Percha system using a bacterial leakage model. Materials and Methods: Seventy freshly extracted human single rooted teeth with fully formed apices were randomly divided into three groups (20 each) and two control groups (5 positive and 5 negative). Teeth were de-coronated, and roots were standardized to a working length of 16 mm. Root canal preparation was done with rotary pro-taper file system in all groups. Group A was obturated using Smart-Seal system (Hydrophilic), Group B using Resilon/Epiphany system (Hydrophilic), and Group C using Gutta-Percha (GP)/AH plus system (Hydrophobic) in a single cone technique. Using Enterococcus faecalis, a split chamber bacterial leakage model was developed to evaluate the sealing ability of three obturation systems. Samples will be monitored every 24 hours for 60 days. Results: All three groups have shown leakage. 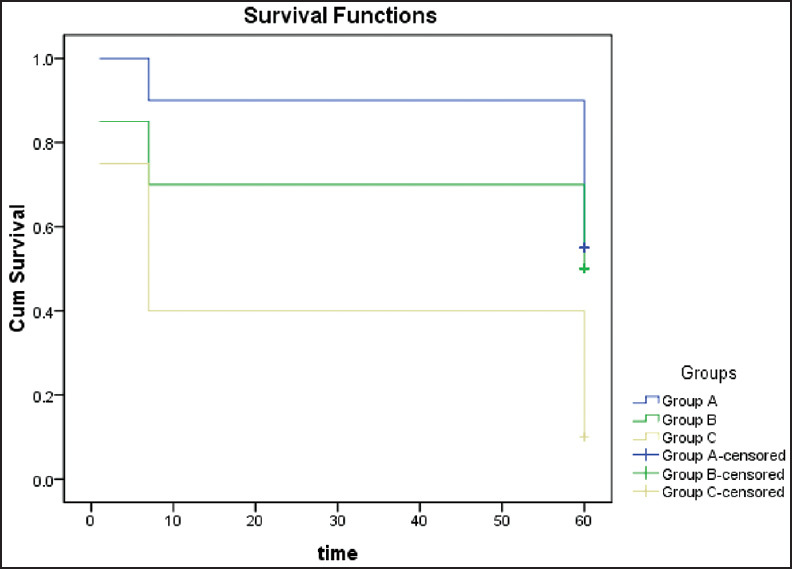 Novel Smart-Seal System and Resilon have shown similar results and relatively lesser samples leaked in comparison to GP obturations at the end of the observation period. There was no significant difference amongst Resilon and Smart-Seal System (P > 0.05) but there was a significant difference amongst them when compared to GP obturations (P < 0.05). Conclusion: Hydrophilic obturations of the root canal shows a better resistance to bacterial leakage as compared to hydrophobic obturations. Background: There is a growing interest about electronic apex locators for working length determination. There are several studies dealing with their performance in different conditions. Aims: The aim of this study is to evaluate the accuracy of Root ZX and Raypex 6 in teeth with different apical diameters. Materials and Methods: Actual working length (AWL) of 80 single rooted teeth were determined as 0.5 mm short of apical foramen. The teeth were divided into 4 groups (n = 20). First group (G 0) included teeth with mature apices. Root canals of the other groups (G 32, G 57 and G 72) were enlarged until apical sizes of 0.32, 0.57 and 0.72 mm were obtained. Samples were embedded in alginate and electronic measurements (EM) were performed. Statistical analysis: was achieved with Fisher exact test. Results: Both devices revealed a high rate of success in G 0 and G 32. Their accuracy decreased significantly in G 57 and G 72 groups (P < 0.05). Intra-group results of Root ZX and Raypex 6 were similar (P > 0.05). Conclusions: Root ZX and Raypex 6 are reliable in teeth with mature apices. At foramen diameters exceeding 0.57 mm, their accuracy is susceptible. Multiple idiopathic external apical root resorption (MIEARR) is a relatively rare condition affecting multiple teeth in a dentition. As the condition is nonsymptomatic, a case is usually detected as an incidental radiographic finding. However, it may cause pain and mobility in severe cases. It is sometimes self-limiting or sometimes may progress to tooth loss. 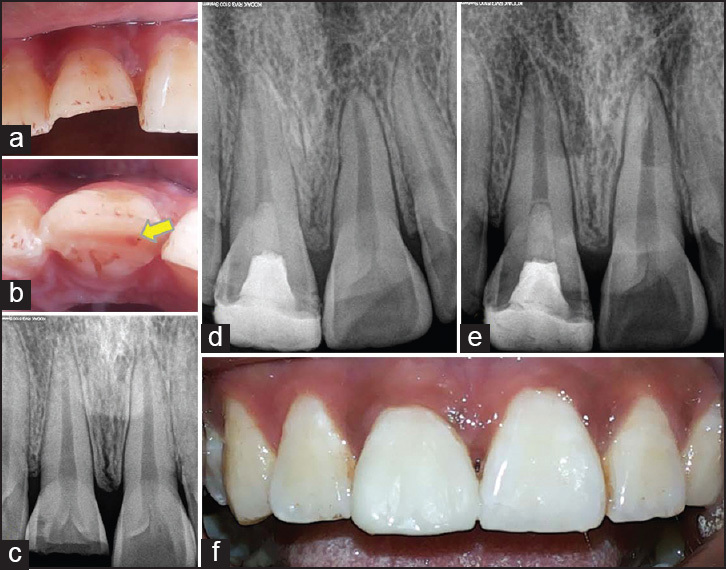 This paper presents a case of external apical root resorption involving multiple teeth in which etiology was not identified, so idiopathic root resorption was considered as a diagnosis of exclusion. Conventionally, few-days-old pulp exposures have been treated with root canal treatment. We report four cases of traumatized, fully matured, maxillary permanent central incisors, which have been treated by Biodentine pulpotomy several days after traumatic pulp exposure. Biodentine pulpotomy consisted of pulp tissue removal to a depth of 2 mm, then capping the pulpal wound with Biodentine, followed by immediate restoration. The teeth were assessed clinically through pulpal sensitivity tests and radiographically for periapical healing. At each recall (24 hours, 1 week, 30 days, 3, 6, 12, and 18 months), no spontaneous pain was observed; the pulp showed signs of vitality and absence of periapical radiolucency after 18 months. Biodentine pulpotomy is recommended as a treatment option for cases of vital pulp exposure in permanent incisors due to trauma.